Invitation Letter For Seminar Participants, Event Participants, Fun fair Participants, guests, honorable guests, clients, customers and consumers. Sample letter to invite guests in festival for games festival, food festival, youth festival, cultural festival, film and college festival etc. We have been organising the Youth Performing Arts Festival (YPAF) for the past 12 years. This year’s YPAF aims at being beneficial for all strata of societies of Pakistan. For this purpose we aspire to form synergies with groups that are working for the betterment of the youth just like us. 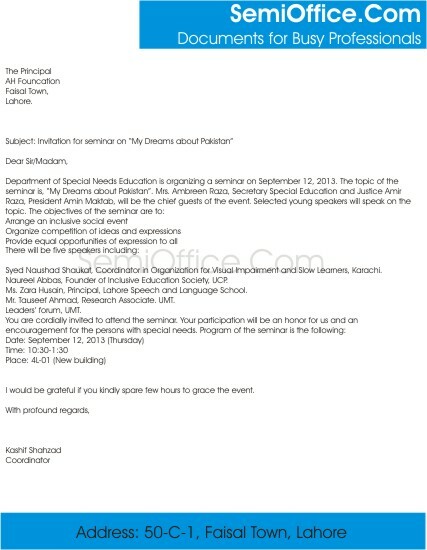 In keeping with the above, the attached document is an invitation for your prestigious organisation. Please feel free to contact me for further queries or assistance. We at Rafi Peer are really hoping that this year’s YPAF will be unlike any other and the youth of your organisation will contribute in making that possible. Syed Naushad Shaukat, Coordinator in Organization for Visual Impairment and Slow Learners, Karachi. Naureel Abbas, Founder of Inclusive Education Society, UCP. Ms. Zara Husain, Principal, Lahore Speech and Language School. Mr. Tauseef Ahmad, Research Associate. UMT. I would be grateful if you kindly spare few hours to grace the event.